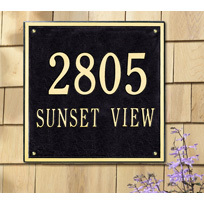 Square Address Plaque 24" x 24"
Home > Address Plaques > Large House Numbers > Square Address Plaque 24" x 24"
No Supercap. Characters in the word are the same height. 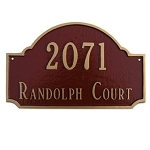 Wall style plaque. 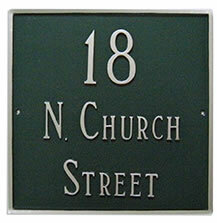 This versatile 24" x 24" square address plaque is ideal for commercial locations or anywhere a large plaque is needed. 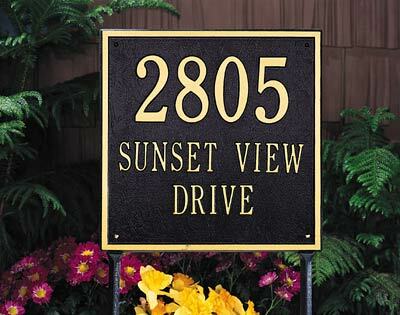 Hand crafted of recycled aluminum, the plaque is treated with multiple applications of specially formulated weather resistant finish. Hardware is included with the plaque. 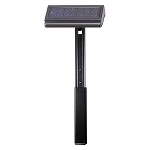 The lawn version includes two 23" lawn stakes. Made in the USA. For customization quotes, send an email to: [email protected] or call our toll-free number: (866) 309-2013. 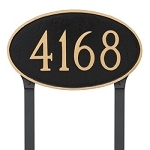 Q: Would there be a way to mount this to a rod iron gate?